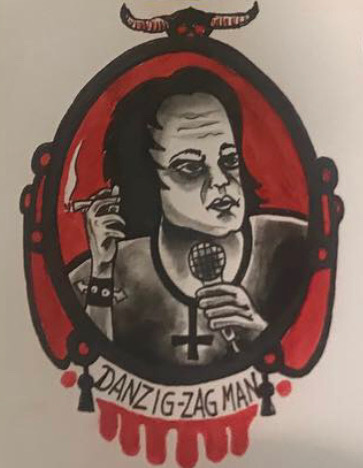 Here at Stoner Living, our hearts warmed like a fresh serving of corned beef hash when we saw this piece of tattoo flash from Hubba Hubba, hide-etcher extraordinaire at the Seattle Tattoo Emporium. The STE artists roared with laughter (after the warbling wails of 'Mother' died down) so a whole sheet is rumored to be in the works, with a possible DanZigfield and Roy centerpiece with hungry white tiger. Hubba says he isn't a huge Danzig fan, but here at Stoner Living we fondly remember blowing out our speakers in high school with a bootleg cassette of EvilLive. Zig-zag rolling papers transport me to Richmond, Virginia, where I went to buy rolling papers at Costco many years ago. Two college kids came into the amble tobacco section, grabbed their cartons of Marlboro Lights and laughed at the Zig Zags saying, "who buys a carton of these?" Well, kiddos, now you know. Hubba tattoos full time at The Seattle Tattoo Emporium, located between Pike & Pine on Boren, near the Seattle Convention Center. It is right around the corner from the Starbucks Reserve joint, so a trip to Starbucks Reserve deserves a stop at the Emporium - just to check out their tattoo museum and buy a t-shirt, even if you don't get ink. If you got tattooed at some point since 1990 in Seattle, there is a chance you already know Hubba. With far more than the 10,000 hours required to make somebody an expert at something (according to author Malcolm Gladwell), Hubba is proficient at his craft of old-school, American tattooing. You can see more of his non-flesh art at his website HERE and you can follow him on Instagram at @weirdoartofhubbahubba.